The U.S. Cooler Game Locker provides an elegant solution for proper deer aging. The Game Locker is a walk-in cooler equipped with up to 8 meat hooks on a sliding rail system. These refrigerators have been reinforced to bear up to 800 lbs hanging from the ceiling. Owning your own Game Locker will allow you (and any friends you let use it) the freedom to hang several deer in the perfect environment for as long as you see fit. It may be hard to justify purchasing a large refrigerator exclusively for use during hunting season. In the offseason, the Game Locker can be used just like any other walk-in cooler to store soda, beer, meat, produce or anything else that requires cold storage. The Game Locker is made of modular insulated panels, so it could be disassembled to save space when not in use. It can be purchased with or without an insulated floor and comes in two sizes: 6’ x 6’ x 8’ and 6’ x 8’ x 8’. If you use the Game Locker with the best practices for deer hanging and processing, you can produce venison that is both tender and has amazing flavor. To learn more and get a price quote, visit the U.S. Cooler Game Locker page or download the Game Locker brochure. 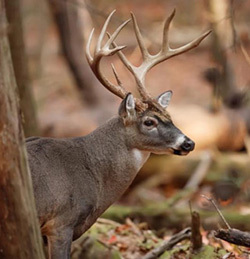 You can also download MSU’s guide to harvesting, dressing and cooling deer.